US admits that it fired DU on two occasions in November 2015, contrary to earlier claims; military justification for use unclear after target analysis; ICBUW and PAX call for full disclosure to facilitate harm reduction measures; Russia takes advantage of news to distract from its own conduct in the conflict. This US strike against an Islamic State fuel truck convoy on 18 November 2015 may have involved DU. The news comes as governments are debating a UN General Assemblyresolution on DU weapons in New York. And, although DU use has only been admitted on two dates, ICBUW and PAX are concerned that this disclosure could be the sign that DU has, or will, be used more widely in the conflict. The US regularly states that DU ammunition is specifically used only for engaging armoured targets, in accordance with its own legal guidelines, although evidence from a number of conflicts has shown that these guidelines are commonly ignored. ICBUW had earlier analysed the target information released by CENTCOM for the two dates in question. On neither date did CENTCOM explicitly state that it had launched attacks against armoured vehicles, with the majority of strikes against Islamic State light tactical vehicles, vehicle-borne improvised explosive devices and oil infrastructure. Such targets have been attacked regularly by the US-led Coalition, apparently without resorting to the use of DU. The most unusual strike that ICBUW identified took place on the 18th November, when the US attacked 283 parked oil tankers, however the A-10’s alternative 30mm ammunition type – a high explosive incendiary round – would presumably have been sufficient to destroy tankers laden with oil. Footage released from the strike is indicative of 30mm DU use. Recently published data from the 2003 Iraq War showed that A-10s used more DU against targets that were not tanks or armoured vehicles, questioning the current US justification that DU was needed in Syria. Historic data from the Gulf War also demonstrated that most armoured targets destroyed by A-10s were targeted by Maverick missiles, not DU. ICBUW and PAX are calling for urgent clarification from the US authorities on both the incidents and its DU policy for the conflict, and for them to swiftly release detailed and accurate targeting data to ensure that the relevant authorities can conduct clearance and risk awareness efforts and isolate and recover contaminated material. The US has long been conscious of the stigmatisation of the use of DU weapons. As far back as 1991 the US military were advised that: “…fielding and combat activities [with DU] present the potential for adverse international reaction.” It was therefore predictable that Russian state media quickly highlighted news that DU had been used in Syria, with Russia’s embassies in Paris, Ottawa and Londontweeting the news, as Russia sought to draw attention away from its own conduct in the conflict. Russia has its own stocks of DU weapons and consistently abstains on DU resolutions at the UN General Assembly. It seems inevitable that, given the widespread global opposition to the use of the weapons, the Russian and Syrian governments will continue to use the news that DU has been used against the US and its coalition allies. …I suddenly had a flashback. A dream I had about 6 months prior to the second Gulf War. I dreamt of a young Iraqi boy, being held by two American GI’s and uplifted to be crucified on a cross. They nailed him to the cross and walked away. I woke up choking. I said to myself, they tortured the children of Iraq now they will crucify them. The boy is now resurrected and is guiding my pen. He is asking me to draw him crucified on a old rotting wooden cross. He tells me that he wants the background to be filled with a half million skeletons of dead babies with Ms.Albright smiling on top of them. 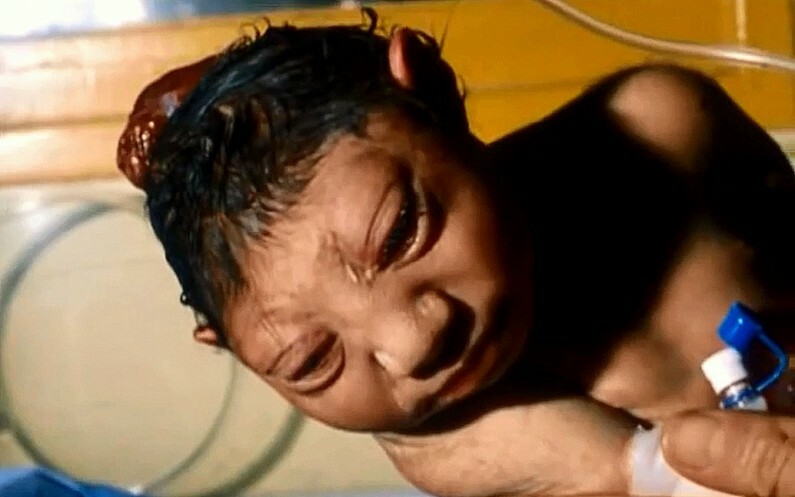 He is asking me to draw newborns with grotesque deformities due to depleted uranium. He is urging me not to forget the starving looking babies due to malnutrition. He is making sure I paint the children who have cancer because of american chemical weapons, queuing up in desolate hospitals. And he has not forgotten the children who survived in tattered clothes with their tattered textbooks walking barefoot to school. Oh wait, he is also telling me to draw in the corner, a picture of the orphanage bombed during the war of liberation and he is making sure that I show the kids running in the streets desperate with nowhere to go � some kidnapped, some sold whilst others raped. I asked him if he wanted me to add anything. He said the picture is almost complete. “What shall I call it?” I asked. “The World as I see it”. US army marine forces praying in tent before US bombing and cluster bomb attacks on Iraq. Terry Jemison of the Department of Veterans Affairs reported this week to the American Free Press that �Gulf-era veterans� now on medical disability since 1991 number 518,739, with only 7,035 reported wounded in Iraq in that same 14-year period. Soldiers developing malignancies so quickly since 2003 can be expected to develop multiple cancers from independent causes. This phenomenon has been reported by doctors in hospitals treating civilians following NATO bombing with DU in Yugoslavia in 1998-1999 and the U.S. military invasion of Iraq using DU for the first time in 1991. Medical experts report that this phenomenon of multiple malignancies from unrelated causes has been unknown until now and is a new syndrome associated with internal DU exposure. Just 467 U.S. personnel were wounded in the three-week Persian Gulf War in 1990-1991. Out of 580,400 soldiers who served in Gulf War I, 11,000 are dead, and by 2000 there were 325,000 on permanent medical disability. This astounding number of disabled vets means that a decade later, 56 percent of those soldiers who served now have medical problems. The number of disabled vets reported up to 2000 has been increasing by 43,000 every year. Brad Flohr of the Department of Veterans Affairs told American Free Press that he believes there are more disabled vets now than even after World War II. Iraq and Kosovo may be thousands of miles apart, but they share the dubious distinction of contamination with radioactive residue from depleted uranium (DU) bullets used in American air strikes. After several years of silence, US officials finally admitted that 340 tons of DU were fired during the Gulf war. In Kosovo, American delays in providing details of quantities and target points have frustrated international efforts to assess health risks. Despite repeated requests, NATO waited almost a full year after the start of bombing in March 1999 to say that 31,000 DU bullets — a fraction of the number fired in Iraq — were fired by A-10 “tankbuster” aircraft over Kosovo. A Belgrade report published this April estimates that about 50,000 DU bullets had been used in parts of Serbia and Montenegro as well as Kosovo. Evidence is plentiful on the ground that DU was used in heavily populated areas, and that civilians and returning refugees were never warned of the danger. The high-density bullet is made of low-level radioactive waste left over from manufacturing nuclear fuel and bombs. DU bullets were designed in the 1970s to defeat top-line Soviet tanks. Some 20 nations now keep the world’s best armor-piercing rounds in their arsenals. First used in combat during the Gulf war, they proved to be unmatched tank slayers. (A Pentagon official points to one other benefit: the US can give away its 1.2 billion pound stockpile of radioactive waste to weapons manufacturers.) When DU smashes into a hard target, it pulverizes into breathable dust that remains radioactive for 4.5 billion years. American nuclear scientists have found that DU dust can travel at least 26 miles. Scientists of the National Institute for Health Protection in Macedonia detected eight times higher than normal levels of alpha radiation — the primary type emitted by DU — in the air during the air war. Yugoslav soldiers have found DU rounds in Bujanovic in the south, and a Swiss-led international team found “serious radioactivity” when it dug up many rounds at a radio tower near Vranje.